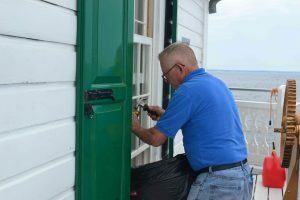 Workday: Thomas Point Lighthouse June 11, 2016 – Chesapeake Chapter U.S.L.H.S. We had a large crew this time for the Thomas Point Workday and it was a perfect day to be out on the bay. It was quite warm, but there was a steady wind that kept us quite comfortable. All the windows and doors were open and we had a fairly constant breeze. 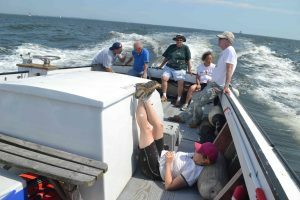 We had a bakers dozen this time as thirteen people spent the day out at Thomas Point. Even with this many people it wasn’t too crowded. We had people working on every floor. On the main deck the newly replaced pickets were sanded. 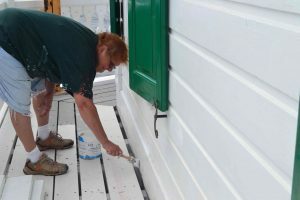 The siding was inspected and spots were sanded and painted. The broken windowpane was replaced. Others worked on calking the areas where the railings and posts joined. The exterior railings top and bottom were painted. 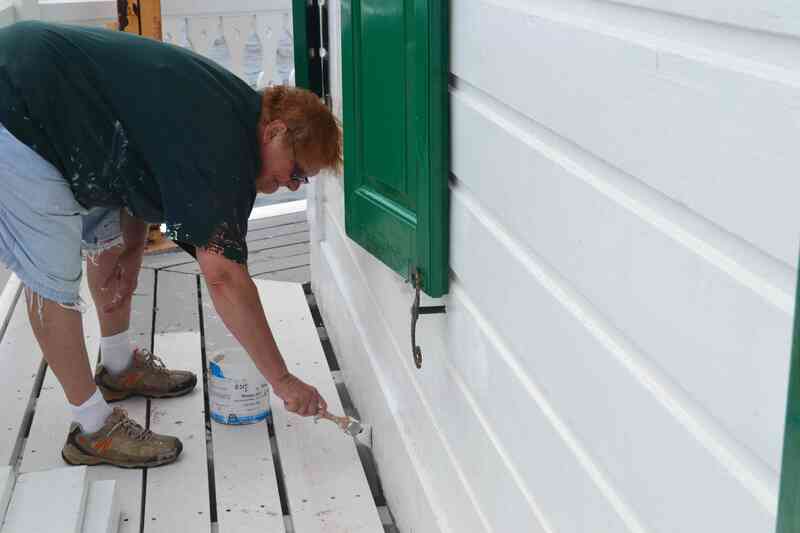 The stairwell between the first and second floors was given a new coat of white paint. 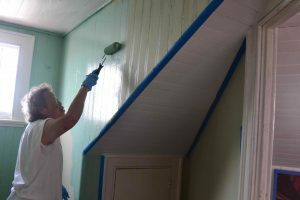 One of the rooms on the upper levels was given a coat of sea foam. A start was made on creating a shadow box in the equipment room that will be used to show visitors the current state. The rest of the room will be restored to an earlier time frame. Up top in the lantern area a crew took measurement for the replacement of the glass. 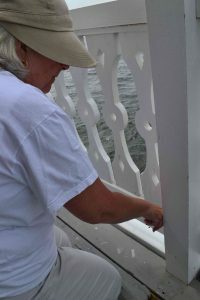 They worked out how to remove and replace the existing glass and took all the necessary measurements. 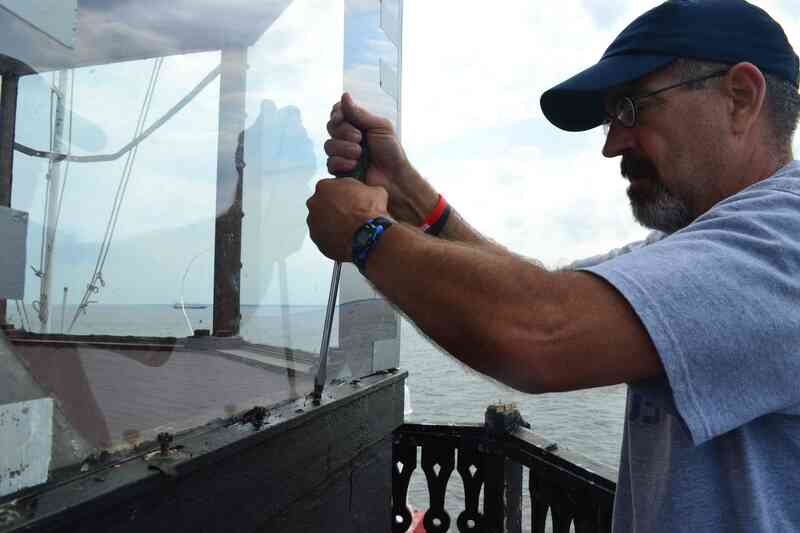 There is a temporary pane in one spot, but all the glass will be replaced later this season. 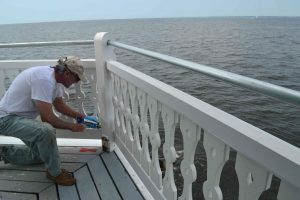 Down below on the deck beneath the light a coat of Rust-Oleum was applied to rusty spots on the tie rods. 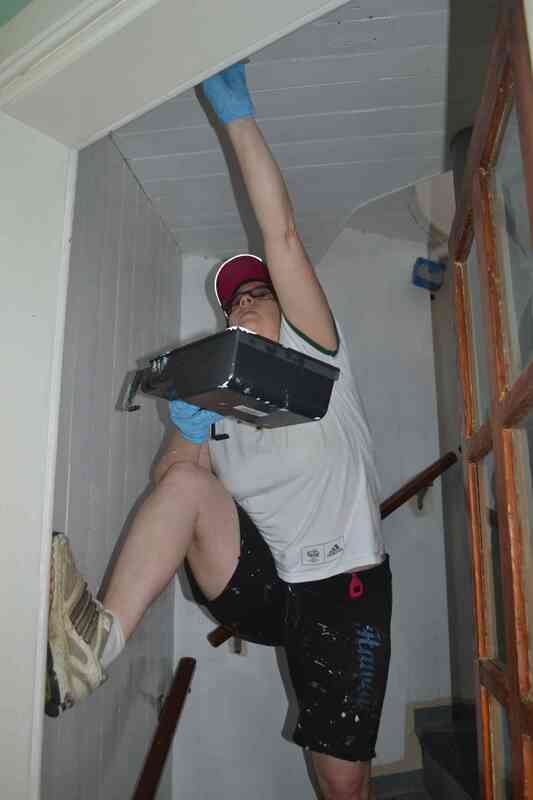 It was a very productive work day and a lot was accomplished. 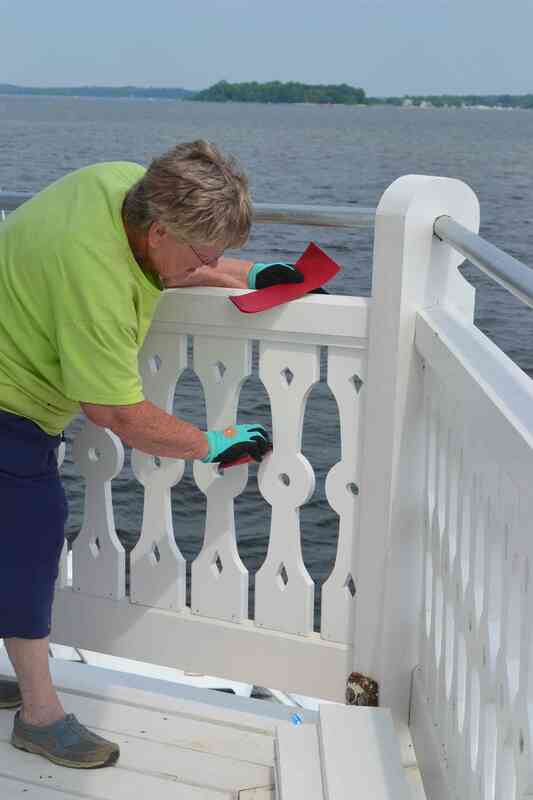 Steve caulks railings on main deck. 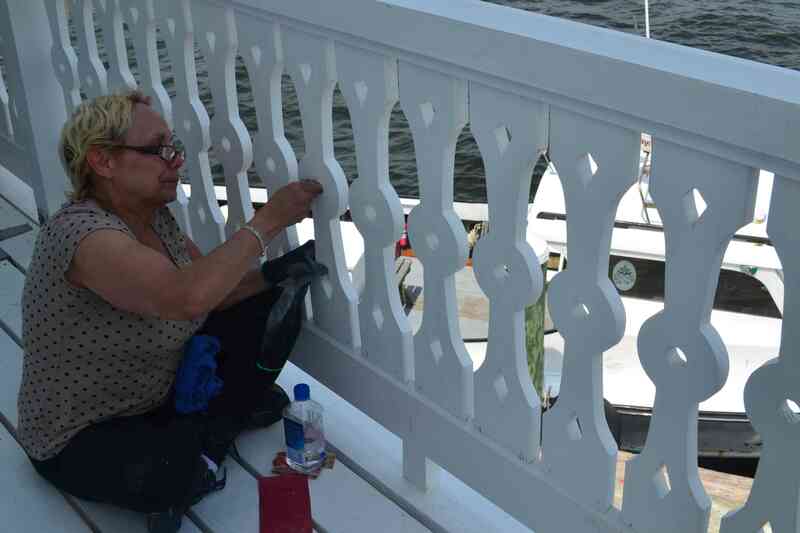 Mary caulking railings on main deck. 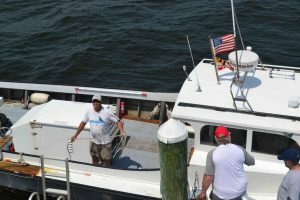 Howard taking Tom back to the mainland. Henry working on lantern room window. Folks relaxing as we head back in after a day at Thomas Point.